Clexpark - Saloon boys - Bee burps! 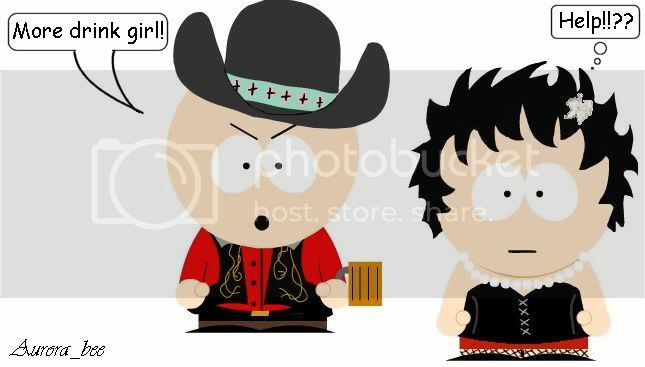 So time for a little role play and cowboy Lex and Saloon girl Clark! Heee! I could totally see Clark being overwhelmed by the sight of Lex with a ten-gallon hat. Cute. Clark's wearing a corset, and fishnets... He's obviously been watching the Rocky Horror Picture Show *g*. And Lex is wearing a hat... a cowboy hat. Sorry, I don't have anything intelligent to say, I'm completely brainless due to yet another wonderful Clexpark moment. Oh my... that is too priceless! And I enjoy it so much lol! And wee Clark is so cute! let us dance the dance of insanity together!Weeee! Wee! Skip to the beat! ROTFL!! Lex in a cowboy hat! I just love dressing them up! Why does everyone mention Lex and not Clark dressed up like a whore though??? I don't know! *repents* But I do love that corset, though! damn you are good woman!!! Well you know it comes so easy with those 2! *snort* Poor Clark. He better get some ale out before Lex pulls out the whip with the Kryptonite tips. How about 'Red bull it gives you wings'? Yup I've lost it! Hope I can belly up to the bar to ya-hoo to that sight!